Go to the YA Scavenger Hunt page to find out all about the hunt. There are THREE contests going on simultaneously, and you can enter one or all! I am a part of the INDIE TEAM--but there is also RED, BLUE, GOLD, GREEN, ORANGE TEAMS -for a chance to win a whole different set of signed books! Collect the favorite numbers of all the authors on the INDIE TEAM, and then add them up (don't worry, you can use a calculator!). Rules: Open internationally, anyone below the age of 18 should have a parent or guardian's permission to enter. To be eligible for the grand prize, you must submit the completed entry form by 5th October, at noon Pacific Time. Entries sent without the correct number or without contact information will not be considered. Today, I am hosting KAI MCCARTHY on my website for the YA Scavenger Hunt! Kai grew up in Grand Rapids, MI. She started writing in middle school, and is an avid reader. 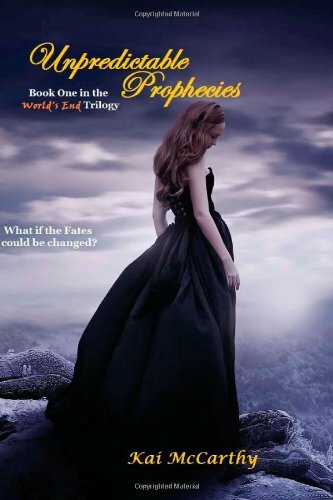 Her book, Unpredictable Prophecies came from a dream. Acadia Mills is the center of an end of the world prophecy. With the help of her guardian, Samael, she tries to break her fate. Encountering angels was never part of the plan. And don't forget to enter the contest for a chance to win a ton of signed books by me, KAI MCCARTHY, and more! To enter, you need to know that my favorite number is 7. Add up all the favorite numbers of the authors on the INDIE TEAM and you'll have all the secret code to enter for the grand prize!